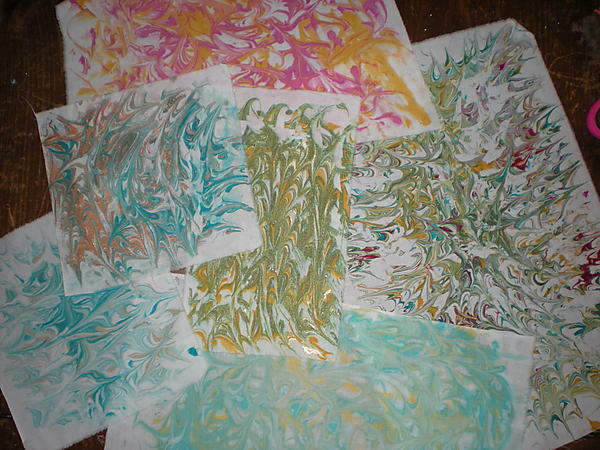 My daughter and I spent the afternoon marbling fabric. I had heard of a technique that used shaving cream as the suspension for the paint. We had so much fun!!! First you start with a work surface. 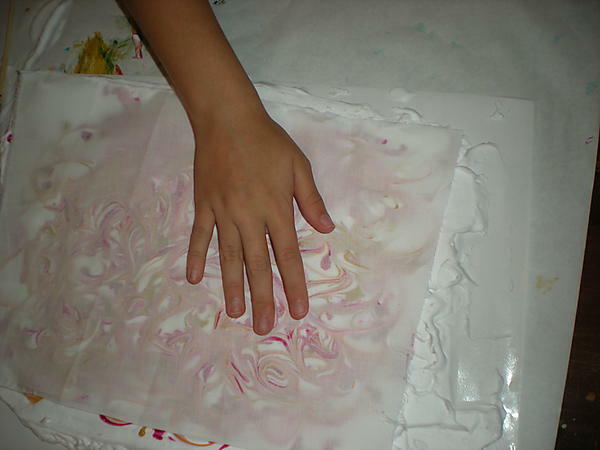 We covered the table with craft paper and then used the shiny side of a large piece of freezer paper. 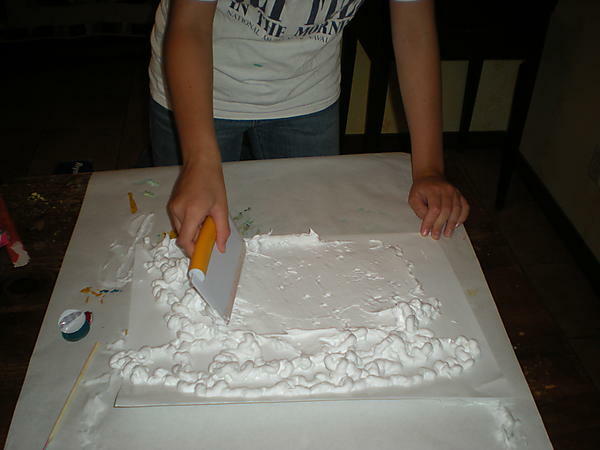 The foam shaving cream is sprayed onto the freezer paper – a little larger than the size of your piece of fabric. Then you start adding the paint to the surface. We tried several different ways and liked the way it looked to just put drops all over instead of lines of paint. 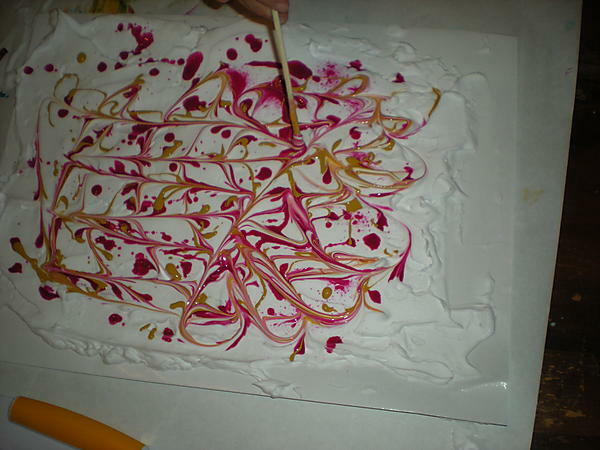 We only used two colors on this piece – pink and yellow. 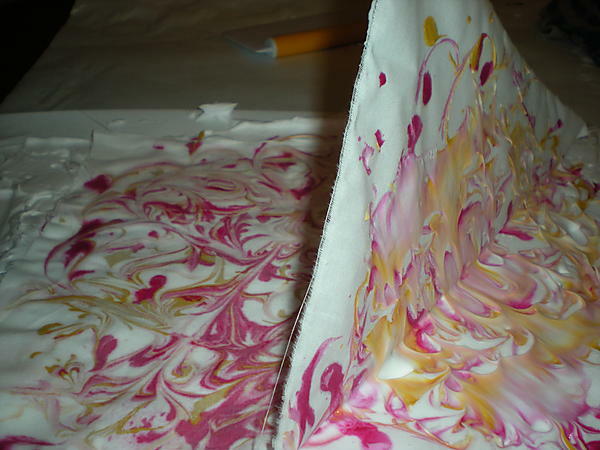 Once all the paint is on the shaving cream, you start to make the design. We used chop-sticks to swirl the paint. Do not overwork it or it will loose it’s definition and start to look brown or muddy. When you are pleased with the design, carefully lay the fabric down. We used muslin. Gently smooth out the fabric – do not push down. Wait a few minutes and then carefully lift off the fabric. Use the pastry cutter or a squeegee to remove the excess shaving cream. Make a swipe across the fabric and then wipe the edge of the tool clean before making the next swipe. If the tool is not clean it will smear the paint. Heat set the paint using a hot, dry iron. We used a pressing cloth and there was a small amount of paint bleeding into it so I am very glad we did. These are some of the fabrics we did. 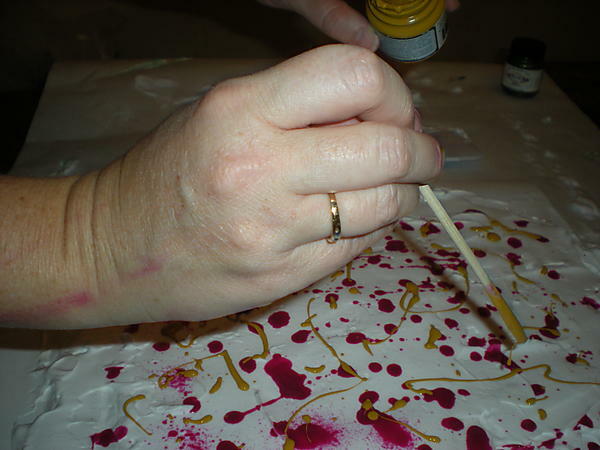 do you use acrylic paints found in any craft store? I use Jacquard Textile Paint that I found at JoAnn Fabrics. I really like this paint because it does not change the hand of the fabric. Was the fabric pre-treated in any way? Did the colours stay fast after washing? No. 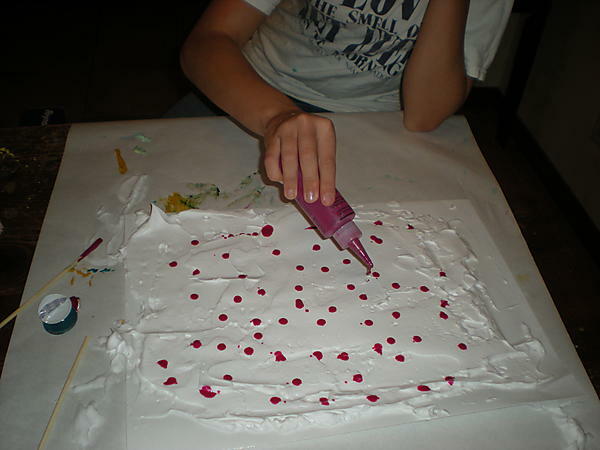 There is no pretreating necessary since it is using fabric paint. I did not even pre-wash this muslin. It is important to heat set the paints after, if you are using the Jacquard paints. The colors have stayed fine with washing. I am not sure about the food coloring. Normal acrylic paints may work but may make the fabric really stiff. I like to stay with fabric paint. 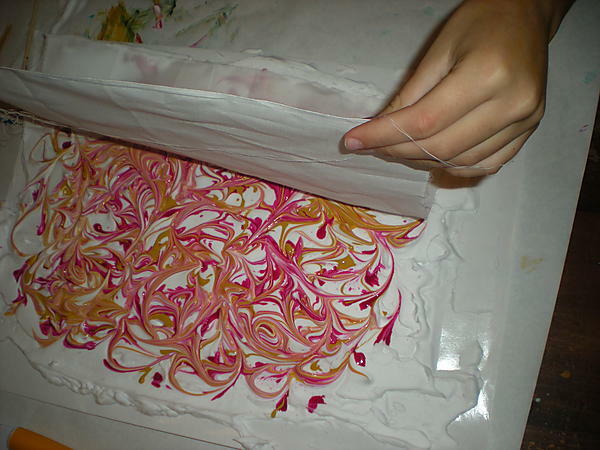 It is possible to do this technique with dyes as well but it is a more complicated process. Where did you buy the muslin- at JoAnn's? did you wash the fabric at all right after you cleaned up the excess of the shaving cream? Rob- The paints that I use must be heat set before washing the fabrics. I use a pressing sheet and a hot iron and then to be safe throw it into a hot dryer for 30 minutes. If heat set the fabric washes great. Thank you very much for your tutorial. I already have the Jacquard Textile Paints and was wondering how well they would work for shaving cream dyeing. Your pictures are really helpful. They show that the designs remain crisp even after swirling, and how the paints stayed vibrant when transferred to the fabric. Great, easy to understand instructions. I am definitely trying this now. gostei muito dessa ideia, vou fazer algum dia desses. I have pebeo paint Do you know of this? Will it work? @ Kathleen I have never used that brand before but it looks like they have a type of fabric paint. I would just make sure that you can heat set it and try it on a small piece before making a large investment of time and money. 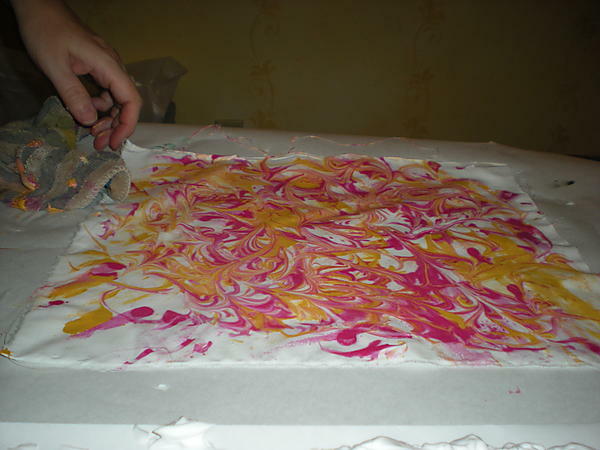 Can use use a second piece of fabric on the shaving cream and paint before throwing it away? Can you rinse the shaving cream off before heat setting? @Eleslie. 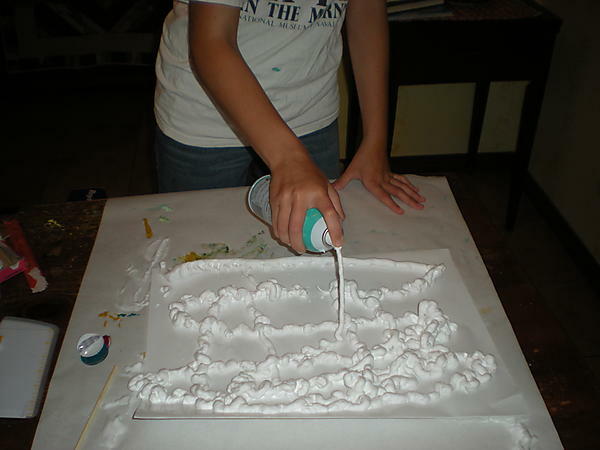 You do not want to add water to the piece until it is heat set as it will rinse out the paint as welll. You can throw it in the dryer for 30 minutes once the paint is dry instead of using an iron.